Perhaps one of the most important things we find ourselves assembling daily is our network of inspiring designers and fashion professionals who value community and championing success together. Maria Stanley is a prime example of this. The emerging contemporary designer has developed a coveted collection of '70s inspired pieces that are sought after by it-girls everywhere - many of which happen to be within Maria’s own personal network. We were delighted to learn that her recent collection was heavily inspired by a few of her close friends, four of whom she has personally created inspired/namesake pieces for. 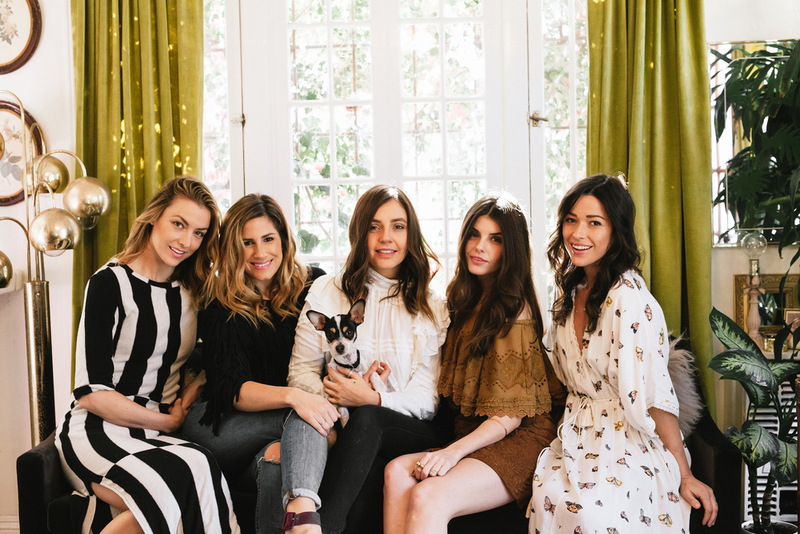 In an effort to get into the holiday spirit and celebrate this personal approach to fashion design, we visited Maria at her home in Silverlake in partnership with The Style Line where we also sat down with the four incredible women who inspired these particular pieces. Discover their stories and our interview with Maria below and head over to The Style Line for an exclusive interview and photos of Maria getting ready for our afternoon. Hi, I’m Maria Stanley and I’m a midwestern girl at heart. I live and work in a bungalow in Silverlake with my puppy, Rue, who I just adopted last week and has the biggest and best ears I’ve ever seen. I enjoy a good dance party, yoga class, and searching for treasures at the flea market. Sunday brunch is my favorite meal. I have the most amazing friends and family in the whole wide world. How would you describe your friends and colleagues in Los Angeles and how has their style inspired your approach to fashion design? I won’t proceed with a design if I can’t picture at least three of my friends frolicking around in it. Each of my friends has their own amazing eclectic style which inspires me in so many ways. So much so, that each piece in the first Spring collection is named after them. How would you describe the contemporary fashion community in Los Angeles? You can be whatever you want to be in Los Angeles! Yes, it is easy to feel the pressure or desire to have the latest style of jean, or that certain designer dress that is flattering on everyone, but we all will style them differently. I love that having a sense of personal style is not only appreciated but admired here. What is the best or most interesting question you’ve ever been asked about holiday style? "To sequin, or not to sequin?" What is your favorite part about hosting/having friends and family over for the holidays and what is usually the main topic of conversation? Eating yummy food with lots of laughter. How do you plan to keep your creative juices flowing during the holiday break? By drinking a lot of champagne and eating Christmas cookies. From Harlyn to Maria Stanley what are some of your confessions as an emerging designer? It is so much work! There is so much behind the scenes that is anything but glamorous. My tips are the same tools as mentioned on The Style Line. Be nice to everyone, ask a lot of questions, always trust your gut, and follow your heart. I’m constantly working on being more efficient and organized in my daily routine, with far less procrastination. It’s also extremely important to me to move towards a more sustainable fashion by educating myself on the carbon footprint the fashion industry is leaving, and what I can do to reduce it in my own collections. Sales Rep at Pop-Arts Mgmt. "LA has always been a place of experimentation and I love how that translates into the way people dress here. Girls mix designer with vintage, passing up fast fashion for something that feels more special. Firstly, SO HARD to pick a favorite because it's all amazing, but I'd style the Sevasti mini with the Tash top, and All Saints leather jacket, dainty layered gold jewelry, and Jil Saunder booties." "Contemporary fashion makes quality, high end clothing more accessible to 'regular' people that have a budget to keep, but still want to feel and look glorious! LA fashion runs on a broad spectrum. All fashionistas use their style as a form of self expression, which causes a very diverse "Los Angeles look" and I think the overall vibe is effortlessly chic and fashion-forward but laid back. I'd wear the Laurena Maxi barefoot, no make up, and hair flowing free with the windows open in a Spanish style home listening to Cat Stevens' Wild World - there's no need to accessorize with this babe. The dress alone makes you feel whimsical." "I love how anything goes. You can be at an event or dinner and half the people are super dressed up or half are super casual and it is all good. There is an ease and a laid back vibe in Los Angeles that you don't get other places. I would style the Perkins Dress with a black Rag & Bone leather jacket with ankle boots or black Stuart Weitzman Nudist Sandals for night, and Jimmy Choo loafers or Converse white high-tops for day. It is the perfect transitional piece." "Contemporary fashion to me is what sets the tone for any occasion, I love the ease as much as I love the complexity of it. As a self proclaimed Jean-O-Holic I love the laid back Los Angeles style, however I am also really inspired by the salad bowl of beautiful humans who flock to this city and that really comes out in not only my personal style but the unique styles of all different Los Angeles neighborhoods. The Lorify Top is my beautiful namesake by Maria Stanley. I am obsessed with it! I like simple clothing that has an edge and some sass, this top is all that and more! I've worn it a few different ways, but my favorite is pairing it with dark wash mid-rise skinny or flare jeans, simple heels and a red lip. The fringe is so '70s and the construction is really beautiful. Maria has always had a way of making this style modern and cool, I love it."